San Cisco are four friends who on the back of releasing two EPs ("Golden Revolver" and "Awkward") have gone onto to write and record their debut album in just under 12 months. 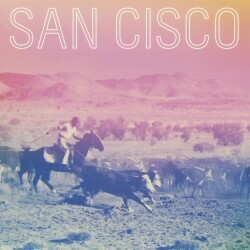 San Cisco’s self titled debut poses a new sound from the Fremantle band, experimenting with synths, keys and guitar licks as well as a few things that they’ve turned upside and on their head in the recording studio under the guidance of Steven Schram. Recorded in winter the band walked four kilometers to and from the studio every day, taking the time to de-brief and add new elements and sounds to their arrangements. Although the cold weather and chilly winter mornings did little to affect San Cisco’s take on bright, indie-pop. The album is a mixed bag of the band’s thoughts on life and growth, relationships and love all tied together with infectious drum beats, slashes of synth and bright catchy hooks. The eleven songs that make up their debut are San Cisco’s take on the world. With their debut album, San Cisco have emerged as sophisticated, showing the sonic soundscape and experimentation of a band beyond their years. 'Fred Astaire' is an upbeat, pop ditty from San Cisco taken from their self-titled debut album. Highlighting Jordi Davieson's soft croon as well as a stomping backbeat (and hand claps), the twinkling of keys and synths; make it impossible not to tap your feet and admire Fred Astaire's foot work!